Repeaters by default have an index for each instance of the form builder. If you declare the fields in your section definition, it won't actually match the fields once rendered. We will have a stream of cards which will hold our repeater data, the below example is from a pricing card block. Scaffold out the stream as you normally would (php artisan make:stream cards namespace.addonType.addonName). You can use the default form builder created by the stub if you want to, however I like to have a dedicated RepeaterFormBuilder and RepeaterFormSections stored under Support/RepeaterFieldType, so we will use that in the example. 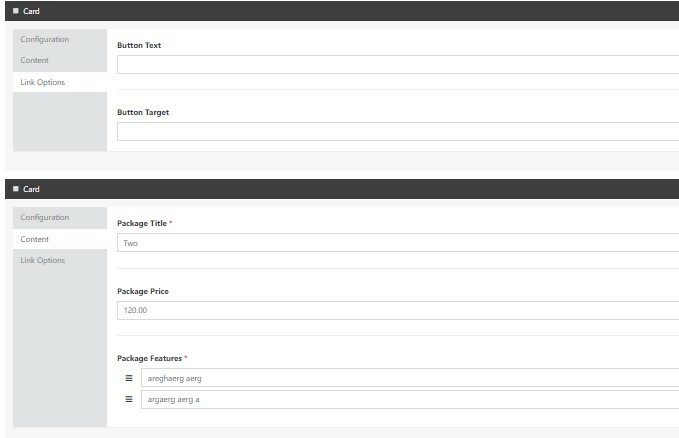 The first thing you will need to do is update the model for the stream to use repeater field types callback so we can use our own custom builders. The nice thing about this is that we are then able to do all the normal form builder things that we would normally like to. 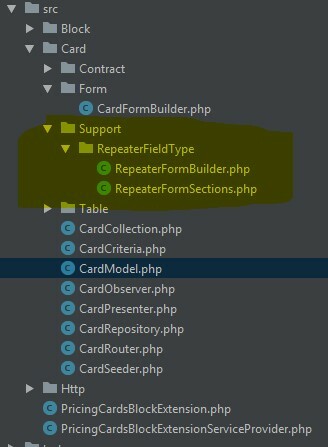 Just remember that each instance in a repeater is its own unique copy of the form builder. Point the sections to your sections class. Add the sections as you normally would in any form builder. The last thing you need to do is prefix the above sections array with the the builders prefix so that the sections will be used. In the end your sections class should look like this.